Washington D.C., USA -- An important collection of Tibetan Buddhist art in the United States has been given to the Smithsonian's Arthur M. Sackler Gallery. Julian Raby, director of the Freer and Sackler Galleries, announced the gift in the presence of the Dalai Lama and the donor, Alice S. Kandell of New York City, on July 16. 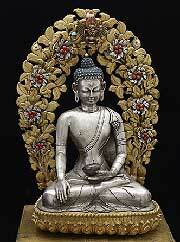 << Shakyamuni Buddha in a full shrine, Qing, probably Dolonnnor, second half of the Eighteenth to early Nineteenth Century, silver repousse image with turquoise urna, floral mandorla with leaves of gilt copper and flowers of silver with coral and mother-of-pearl, heavily gilded bronze lotus seat and base with inset turquoise, coral, and lapis lazuli, 23 by 12 inches. Image courtesy of the Freer and Sackler Galleries. "Your intention is very good," said the Dalai Lama. "Showing Tibetan art and providing an explanation is important. People will gain a deeper understanding of the Buddha and a way of thinking that is very much based on peace and compassion." Kandell, a child psychologist, author and photographer with a lifelong interest in Himalayan culture, carefully built the collection, including a magnificent shrine room containing hundreds of Tibetan Buddhist bronzes, paintings and objects, over four decades. The shrine room is considered the only one of such magnitude and artistic quality in the United States and will significantly transform the Sackler's collection of Himalayan art. The shrine contains 220 objects — bronzes, thangkas (scroll paintings) and ritual implements created between the Twelfth and Nineteenth Centuries on the Tibetan Plateau and in China and Mongolia, as well as textiles and painted chests dating from the Nineteenth and early Twentieth Century. Among the most impressive objects in the collection are large gilt-bronze Buddhas and bodhisattvas dating from the Fifteenth–Eighteenth Centuries, an exquisite Mongolian silver Buddha with seashell and coral adornments, a superb gilded bronze of the goddess Tara with a gem-encrusted crown and jewelry, attributes and thangkas, framed within their original silk brocade and possessing their original finials. Large collections of Tibetan sculptures that retain their original, separately cast, jewel-encrusted crowns, earrings and attributes are rare. For Kandell, the gift of the collection is the culmination of many years of appreciation of Tibetan sacred art and culture, combined with a longstanding desire to share it with the public. "I have always wanted to offer the same joy and fulfillment that I have gotten from this shrine room to others, so I am delighted that the Smithsonian is helping to present the shrine in a way that retains its integrity," she said. "The works of art contained in the shrine are part of the culture and life of Tibet. They belong to the Tibetan people and as such belong to the artistic and cultural heritage of the world." In 2010, the shrine was first exhibited to the public at the Sackler in the exhibition "In the Realm of the Buddha: The Tibetan Buddhist Shrine of Alice S. Kandell," which drew 300,000 visitors in four months. A smaller version of the shrine is on display at the Rubin Museum of Himalayan Art in New York through April 1, 2013. After a period of preparation the shrine will return to the Sackler Gallery for extended exhibition and a possible national tour. Dates for the exhibition and tour have not been announced. The Arthur M. Sackler Gallery is at 1050 Independence Avenue S.W. For information, www.asia.si.edu or 202-633-1000.